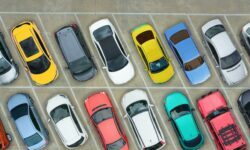 The stable registrations and positive start seen at the beginning of the year in the European car market was soon offset by the diesel crisis, WLTP, and Brexit, resulting in clear winners and losers. It was not an easy year, but some players were able to manage the situation and improve their positions through the right products, positioning and aggressive commercial campaigns. On the other hand, the model changeover, strong diesel dependence and lack of new cars hindered the performance of other players. Jeep: after the “lousy” sales in 2017 (noted by the late Sergio Marchionne in early 2018), the brand is back to strong results. Last year its registrations in Europe increased by a massive 56%, jumping from 107,600 units in 2017 to 167,500 units in 2018. The brand posted both a sales and a market share record, which was above the 1% mark for the first time. In fact, Jeep outsold Land Rover, the European SUV standalone brand, as well as other mainstream brands like Honda and Mitsubishi. The main reason for the good results is due to the arrival of the Compass. This allowed Jeep to offset the growth slowdown of the Renegade (in its fourth year in the market) and the decline registered by the Grand Cherokee and Cherokee. The question is whether Jeep will be able to keep up with this sales growth in 2019. Their immediate plan is to start building the Compass in Italy, which would help to increase its market share. 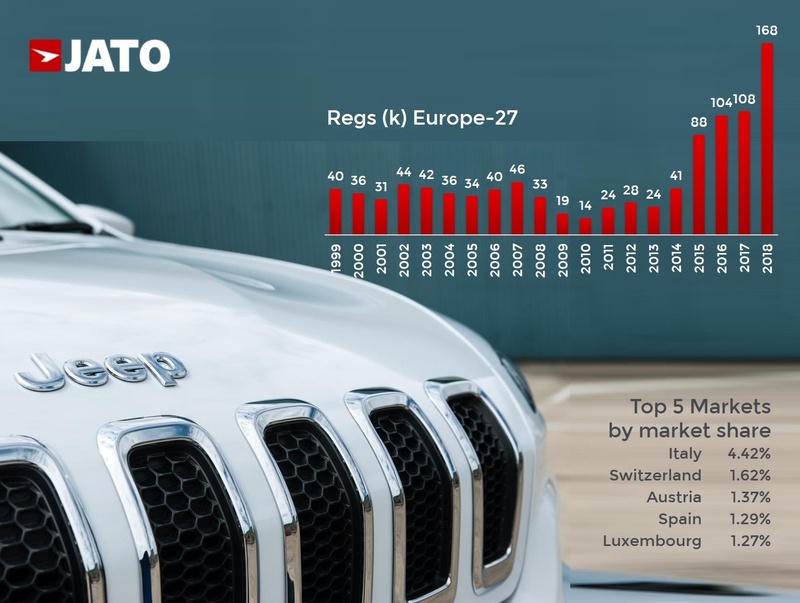 If the current imported version (from Mexico) is outselling even the locally-built Renegade, an Italian Compass could be more popular, especially in Italy. Dacia: for the first time in history this brand sold more than 500,000 cars in Europe. It was the 14th best-selling brand of the continent, and thanks to strong growth (+12%) it was able to outsell a big player like Nissan, its partner. 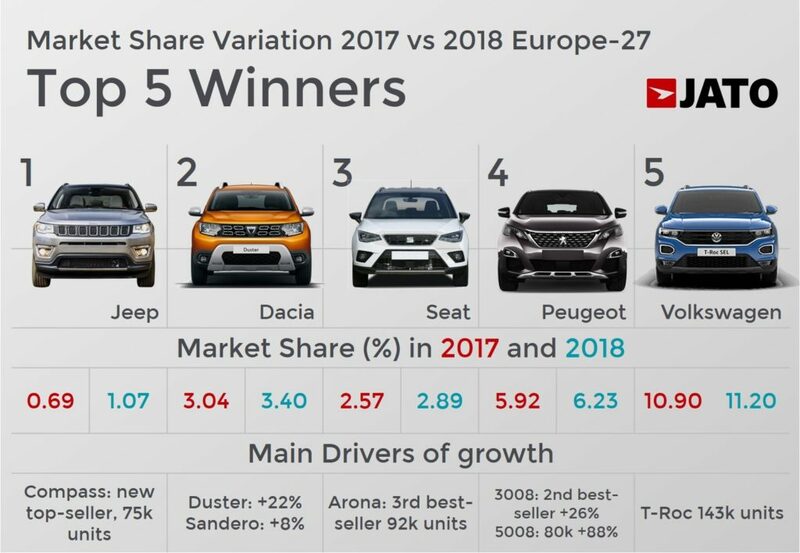 As a result, Dacia became the second largest brand of the Renault-Nissan alliance in Europe, behind Renault, and counting for 23% of its European sales. 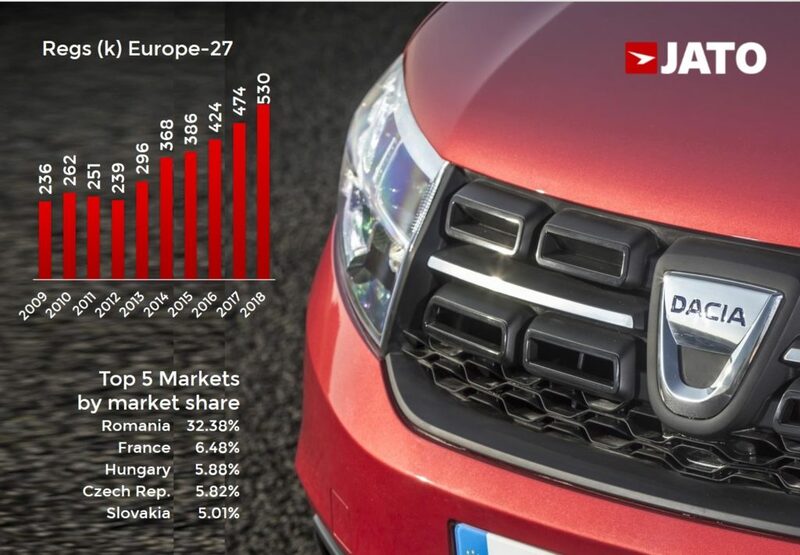 In addition, Dacia confirmed its position as a big profit generator with the highest private registrations penetration in Europe (excluding the small brands). This is mainly thanks to the success of the Duster whose second generation is paying off, becoming Europe’s second best-selling B-SUV, second only to its cousin: the popular Renault Captur. 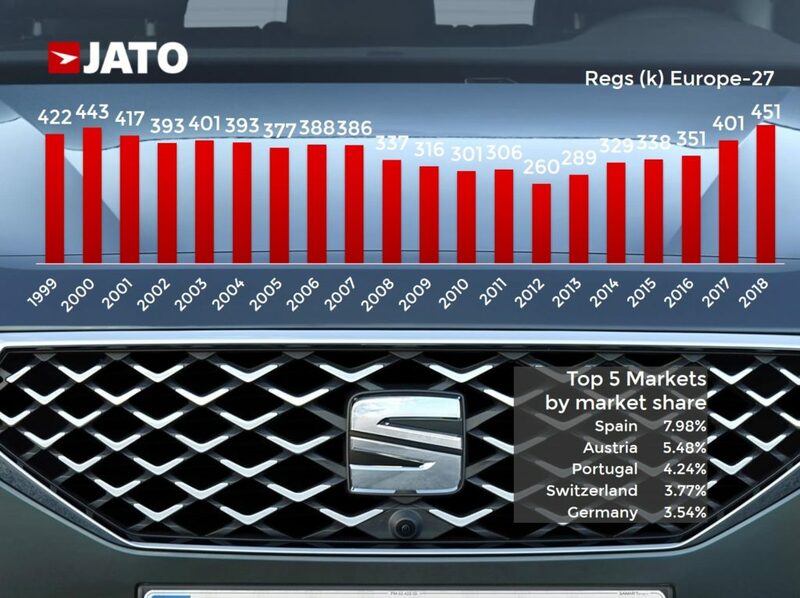 Seat: the Spanish brand also recorded a brilliant year and the highest sales level of the last 20 years. Its volume grew by 12% when compared to 2017, and 73% compared to 2012, when sales hit rock bottom. The growth began with the Ateca in 2016 and continued with the Arona, launched last year. In fact, the small SUV was the only Seat model to record a positive change in 2018. Will the Tarraco help in 2019? Based on the growth of that segment, it is likely to have a positive impact, but the big volume is really seen in the lower segments. Peugeot: outselling its cousin brand Opel/Vauxhall, Peugeot became Europe’s fourth best-selling brand. This was thanks to a 5% increase which was the highest in the top 10 by brands. The Peugeot 3008 and 5008 drove this growth for the second consecutive year. 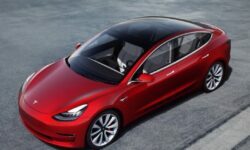 This is quite surprising as both models were already available in 2017, which means that their strong growth continued during their second year in the market. 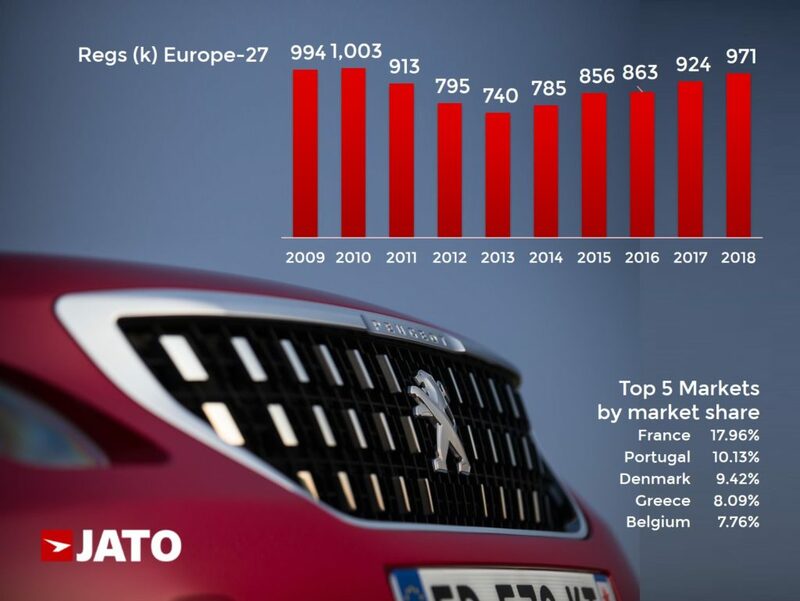 Demand for the 3008 SUV jumped from 162,600 units in 2017 to 204,200 in 2018, becoming Peugeot’s second top-seller and Europe’s third best-selling compact SUV. The 5008 did even better, with a volume growth of 88% to 79,800 units and top ranking in the mainstream midsize SUV segment, outselling the Skoda Kodiaq and Nissan X-Trail. Volkswagen: it was the top-selling brand in Europe in 2018 with a volume increase of 3% to 1.75 million units. This means that they posted the highest registrations volume since 1999, clearly leaving the diesel and emissions issues behind them. 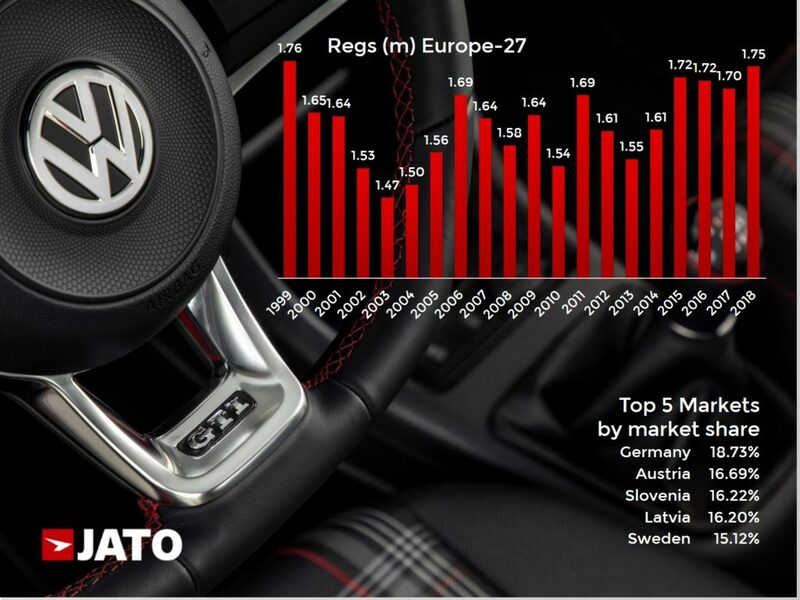 Drivers in Europe love Volkswagen which leads the brand ranking in 12 countries: Germany, Austria, Belgium, Netherlands, Switzerland, Denmark, Norway, Ireland, Slovenia, Croatia, Luxembourg and Latvia. It was also the second best-selling brand in 10 other markets. The main driver of this growth was the SUV segment, which saw volume growth of 61% to 415,700 units, and now counts for almost 24% of its registrations. Volkswagen was Europe’s second SUV seller, behind Peugeot, thanks to the T-Roc and Tiguan Allspace. Kia: the Stonic, Niro and Picanto had strong results which allowed the brand to manage the Rio and Sportage decline. In the case of the Rio, it is unusual to see a 39% decrease considering that it was launched in 2017. Toyota: it enters the top 10 taking out Fiat. This was possible due to the strong growth posted by the Yaris, which also hit the top 10 by models, and the C-HR, which like the Peugeot 3008, continued to grow during its second full year in the market. AFV (mostly hybrid) counted for 59% of its registrations. Citroen: it is finally seeing the results of adding SUVs to its lineup. 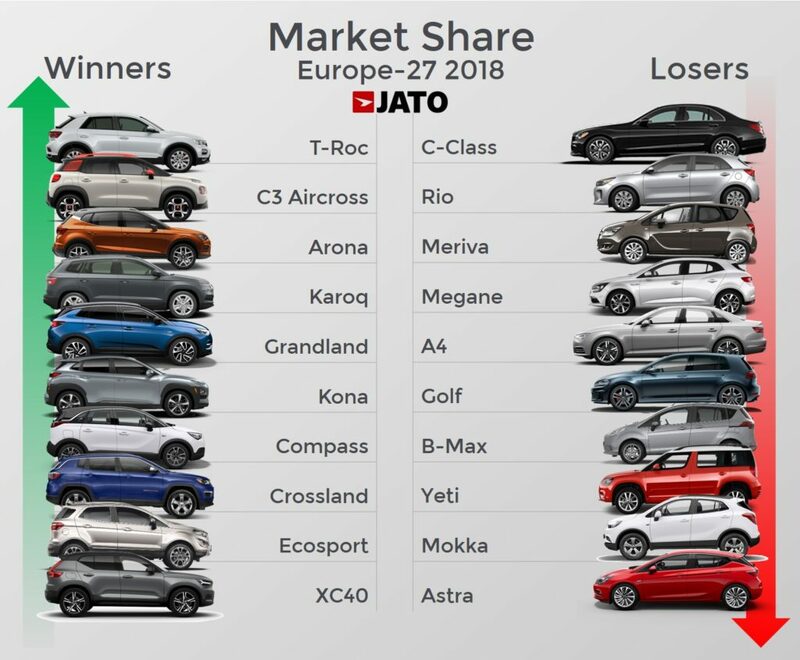 The arrival of the C3 Aircross boosted its registrations to the point where its increasing volume was enough to offset the MPV crisis and its impact on the C4 Spacetourer. Mitsubishi: had the highest registrations volume since 2007 and it was all thanks to the Eclipse Cross. The Outlander became the brand’s top-seller. Hyundai: two models allowed Hyundai to register a new record in Europe. The Kona sold 67,300 units occupying the 15th position in the B-SUV ranking, outselling the Countryman and CX-3. The Ioniq also contributed with a volume increase of 45%.